Media dis&dat: Accessibility standards in Ontario, Canada, considered "very weak"
Accessibility standards in Ontario, Canada, considered "very weak"
We've been lumbering through committee after committee, tinkering with standards sector by sector, frittering away the 15 years remaining to the blurred 2025 deadline when all the barriers are supposed to disappear. Maybe. Now, as it grinds into pre-election mode, Queen's Park says it has listened to public “feedback” and is planning to “streamline” and “align” the whole process with an integrated standard covering access to transportation, information, communication and employment. The proposed new integrated accessibility regulation, on display on the provincial government's website, is open for comment until Oct. 16. Already the Accessibility for Ontarians With Disabilities Act Alliance, led by activist David Lepofsky, has some reservations, to put it mildly. It has posted a draft of the comments it plans to submit. But first, it wants input from its constituents. The alliance has posted a draft brief of ideas for improvement on its website. It asks that you email feedback by Oct. 1. It also urges groups with expertise in specific disability issues to submit ideas to Queen's Park. • Public sector employers and larger private sector employers should take proactive measures to remove existing workplace barriers and prevent new barriers from being created. • Timelines for compliance should be substantially reduced. • People with disabilities who are the victims of a barrier should have a clear avenue to lodge complaints, have their views heard and be notified about the ongoing status of the case, including any final dispositions and appeals. • Establishment of a new tribunal, with expertise in disability accessibility, accommodation, and related human rights issues, to hear AODA appeals. • The penalties for violating accessibility standards should be raised. As part of this year's Abilities Arts Festival, check out Signals from the Stage, Thursday, Oct. 7 at the Betty Oliphant Theatre on Jarvis St. 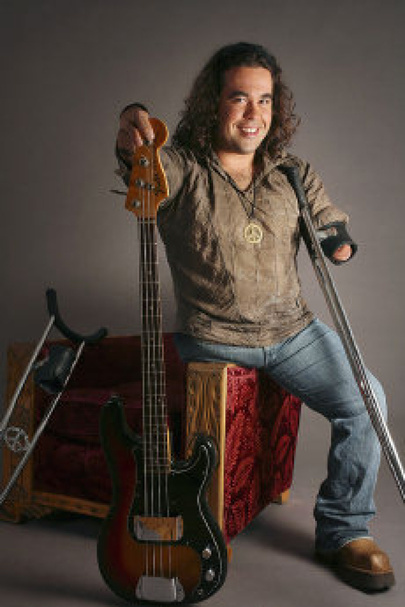 It features Quebec singer/songwriter Martin Deschamps (pictured), who entertained the world as part of the opening ceremonies of the 2010 Paralympics. Also on stage: bluegrass/country virtuoso Shawn Brush, also known as Krooked Cowboy, dancer Spirit Synott, comedian Andre Arruda and poetry by Irena Kagansky, Barbara Landry, Philip Tétrault.